Nesting: Why Isn’t She Sitting on the Eggs? Question: After the mother peregrine has laid an egg, why doesn’t she sit on it all the time? Answer: Peregrines usually lay 3-5 eggs per clutch but they don’t begin incubation (to raise the eggs’ temperature) until they’ve laid their next-to-last egg. The mother bird shelters the eggs to make sure they don’t get wet or freeze and if it’s very hot she shades them. But she prevents early development of the first eggs by not incubating them until her clutch is nearly complete. The result is that all the eggs reach maturity at the same time and hatch on the same day. (The last egg may hatch a day later because it was laid after incubation began.) Thus the chicks are all the same size as they start life together. 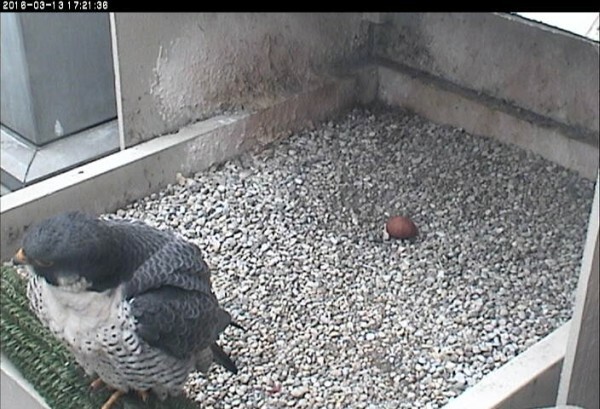 Peregrines aren’t unique in using this incubation strategy. Ducks and geese delay the start of incubation so that their young all hatch at the same time and can swim away with mother when hatching is done. How long before the eggs hatch on the Gulf Tower? The earliest date the eggs will begin hatching is probably May 10 — if then. This year, because of the changeover in resident females (Tasha replaced by Dori), the eggs weren’t incubated consistently at first. This means they might hatch sequentially days apart from each other. We just don’t know.